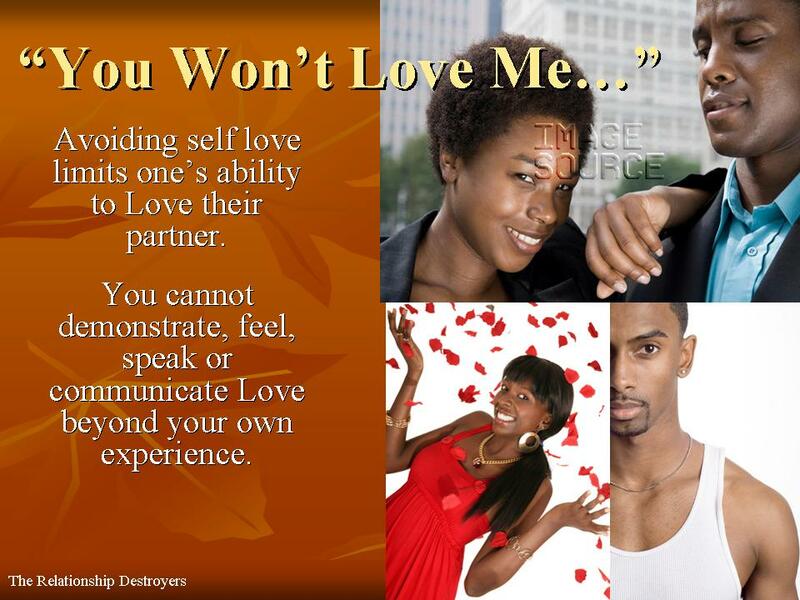 A partner who does not have self-love puts a strain on the relationship, especially if his/her partner has self-love. These two types of partners are not paired up correctly, thus creating an imbalance. The partner with the problems of self-love will require much more emotional support, leaving the other partner to carry the burden of the relationship in many ways. This is a burden, because the partner who is devoid of self-love will have a hard time bringing a balance due to his/her emotional instability. The only other value he/she may bring is financial, and I would proceed with caution on that. There may be a delusion of financial power depending on the severity of the emotional deficiency. It is called over compensating. Or this love starved partner may have book sense, but there are missing links that will not result in their wholistic process experience of Love. How can one have book sense and not have self-love? It happens. You have a partner who is book smart, but not smart enough to have a relationship with self. You cannot demonstrate, feel, speak or communicate Love beyond your own experience. It is like trying to spend a million dollars you just don’t have. Being devoid of self-love not only cheats one of all the wonderful characteristics that come with this type of Love, it limits one’s ability to Love their partner. This results in one partner having a broader capacity for loving, because of self-love, and the other having limited capacity for loving. The problems this relationship must endure are often unnecessary, even mentally exhausting. There is not much room for growth due to the upkeep of emotional minutia, thanks to the partner who lacks self-love. This same partner puts a high premium on being loved, yet the Love they require they cannot begin to provide. Self-love helps to establish many core strengths. Some of them are: genuine concern for others, high self-esteem, self-pride, strong character and presence, intelligence, emotional balance, objectivity and the skill of knowhow in handling interpersonal situations. Someone who does not have self-love comes up short of such core strengths and is usually insecure, selfish, suspicious, jealous, and emotional, self-centric, and manipulative. They are usually over dramatic when upset or uncomfortably quiet and somber when having a disagreement with their partner. The extremities in this relationship’s differences will cause needless conflict, because of the opposing views both partners have of the simplest situations from an emotional point of view. Insecurity has needs that are high maintenance, and they have a concern for the irrelevancies they mark as important, but that same concern may be asinine to the partner who is secure. Self-love builds a shield that is difficult to penetrate with an off handed untruth or an ill intended comment. A good example of this would be a disagreement the insecure partner had in the office. In coming home and explaining what happened, the reaction will most likely be indifference from the secure partner. There will be concern for the partner who suffered the emotional blow from the disagreement, but the response from the secure partner will be similar to “Don’t let that comment get to you. It means nothing”. This response may pose a problem. The insecure partner who seeks validation may feel unsupported. Now the relationship has to incur a problem stemming from a situation that happened in the office. Here comes the emotional minutia. It gets more interesting. Even if the secure partner attempts to validate, such efforts could be perceived as condescending. The emotional tidal waves become very unpredictable here. The insecure partner may feel their partner is trying to be perfect or above it all. This will cause further relational issues. They may also feel inferior in the situation, because of the non emotional perspective taken by the secure partner. This further compounds the feeling of being unsupported. Those who lack self-love have an insecurity that cannot be transformed into strength in a time of conflict. It is not that the transforming strength is impossible. It is because their feelings are more overpowering than the will to overcome such feelings. Insecurities are looking for one thing and one thing only— understanding. They want to feel like their feelings are warranted. Now selfishness becomes a factor in the situation. The self-loving partner will do his/her best to support and uphold. Supporting is not a problem, because self-love provides this naturally. But the emotional demand is far greater from their insecure partner, which will be much more compromising than the secure can maintain. If they have the patience to support, even by compromising, he/she will find they are being dummied down from their emotional intelligence and will not be appreciated for making the extra effort. This is because the insecure partner has no idea, nor can he/she begin to fathom in any way just how strenuous these emotional compromises are. The blaring differentials are greater than self-love can continue accommodate. The journey to self-love is the only remedy to give this imbalanced relationship a fighting chance. This entry was posted in Self and tagged cannot love someone if you do not love yourself, demand more love than you can give, my partner doesn't love me, selfish love, spouse doesn't love me, the need for self love. Bookmark the permalink.